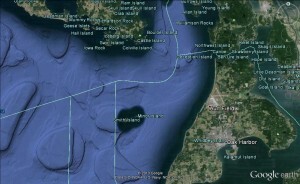 For boaters departing any port south of Edmonds, (or locations on the Key or Olympic peninsulas), the choice of a route crossing the Strait of Juan de Fuca to Cattle Pass will prove to be the shortest distance. Despite the potential savings in time and fuel, crossing the Strait is not automatically or always the best route. Nearly all the commonly steered courses, once past Point Wilson and until reaching Cattle Pass, are free of fixed hazards. The difficulties associated with crossing the Strait consist of potential sea states that most vessels will find uncomfortable. Smaller, lightweight boats with shallow draft can literally be imperiled by conditions often encountered in the Strait of Juan de Fuca, even during the summer months. Unlike the majority of regional cruising waters, the Strait of Juan de Fuca is an unprotected extension of the open Pacific. In a 15-20 knot wind, choppy waves of 3-4 feet will often slam broad abeam into a boat following a typical course to or from the San Juans. Most boats will tolerate such a beating better than the skipper and his or her passengers. Many boaters won’t attempt the Strait if observed or forecast winds exceed 15-knots. At wind speeds above 20 knots, most prudent mariners will drop choose another route, or spend an extra day or two in port waiting for conditions to calm down. Vessels blown to the east or taking an easterly tack to offer a more favorable quarter to the seas need to be aware of Smith Island. Just as in Admiralty Inlet and central Puget Sound, boaters in the Strait of Juan de Fuca must be keenly aware of commercial traffic. If headed for Cattle Pass, between Lopez and San Juan Islands, try for a direct entry into the pass. Be aware of many rocks and islets off the Lopez Island shore to the southeast. Knowledgeable boaters crossing the Strait of Juan de Fuca in acceptable comfort typically include the following considerations when debating a go or no-go consideration. First, of course, are the observable local conditions. If it is blowing 25-knots in Port Townsend or Friday Harbor, it’s unlikely that winds will be less severe in the middle of the Strait. Weather forecasts and condition reports, available on the lowest VHF frequencies can help confirm that seas are reasonable on both sides of the crossing. During the summer months, the calmest seas are normally found in the early morning hours. Winds increase as temperatures rise and cold air rushes in to take the place of warm air that goes aloft. The thermal winds often peak in late afternoon. An early morning crossing, with reasonable local conditions and a favorable forecast, will likely prove uneventful. 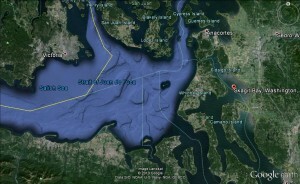 If conditions or the forecast are not favorable, it will normally make far more sense to choose one of the two alternate routes from central Puget Sound to the San Juans.